Yes man! I love how we hold on to some of our Jamaican traditions. One of many is the announcing of events, using loud speakers on or in a car driving around town and in the country areas.…blasting the time, venue, artists and whatever else they care to share, while playing music. Speak about guerrilla marketing, nonetheless a great way to get folks’ attention and get the stage show jamming. Notice how deep the road curves and if you look closely, you’ll also see a little zinc shop off the roadside. ‘Smile, you’re in Jamaica man’. 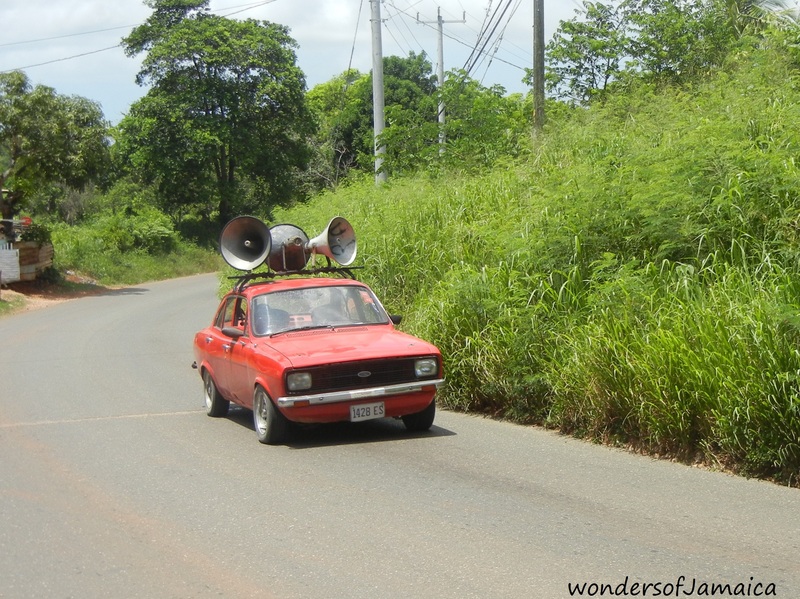 This entry was posted in Culture, Jamaica, Jamaica Vacations, Photos, Traces of Olde Jamaica and tagged guerrilla marketing, Jamaica, Jamaica traditions, photography, shop, Town Crier, travel, zinc. Bookmark the permalink. We have the same thing here in the Philippines especially in the provinces. Back in the days, they also herald around what’s showing in the town movie houses. As kids, we would run out into the streets and enjoy the big big colorful movie posters displayed on these “mobile announcements”. Hi Elmer, thanks for commenting. It sounds like fun growing up with such tradition, it was so exciting as a kid wasn’t it. Thanks for sharing I love learning about cultures around the world.